With the biggest shopping day of the year looming, PLAYMOBIL’s new shopping mall theme lets kids experience the fun and excitement of Black Friday—all from the comfort of their own home! Take a stroll from store to store and enjoy some retail therapy at the Furnished Shopping Mall. The set includes a variety of fun shops, a functioning ATM and elevator and, for the first time ever, interchangeable outfits for the included figures. Chic dresses and skirts can be changed to fit each figure’s own personal style. The Clothing Boutique and Clothing Display also lets kids select and change fashions on the figures and mannequins. Seeking steals and deals on the hottest toys? Look no further than the Toy Shop. The shelves are stocked for the holiday rush with toys, dolls, and of course, PLAYMOBIL playsets! And since Black Friday shopping can be exhausting, figures can pamper themselves at the Beauty Salon. Kids can choose from several different hairstyles to give figures a fresh new look for the holidays and the new year ahead! All smaller sets are compatible with the Furnished Shopping Mall and all outfits are interchangeable and can be switched with outfits from the other Shopping Mall sets. Dimensions: 23.6 x 17.3 x 15.4 inches (LxWxH). Recommended for ages five to twelve. Prepare for the great flood and board the animals two-by-two onto the Animal Ark. 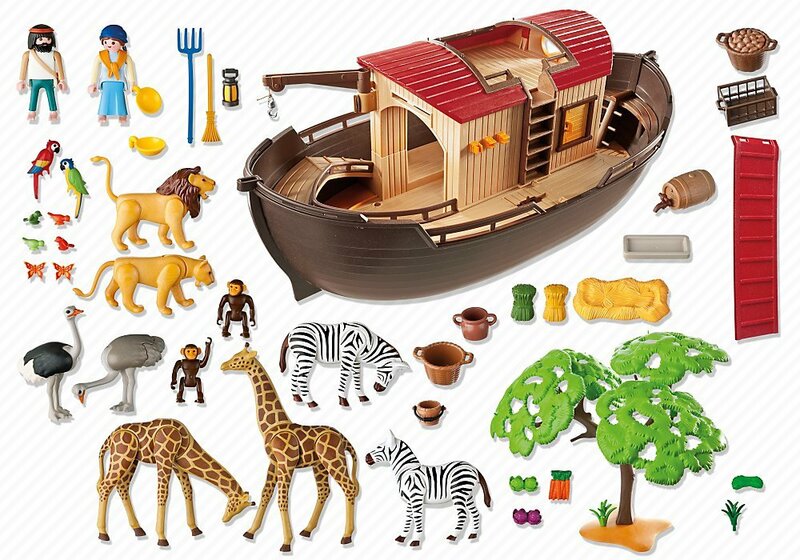 This floating ark has plenty of room for all the different animals, including giraffes, zebras, lions, ostriches, parrots, and monkeys. The functional pulley makes it easy to transport supplies on board and into the various storage areas below deck and in the ark's loft. When not in water, the ark can move using the included rollers which snap into the bottom of the boat. Set also includes two figures, loading ramp, vegetables, hay, baskets, birds, butterflies, tree, lanterns and plenty of additional accessories. 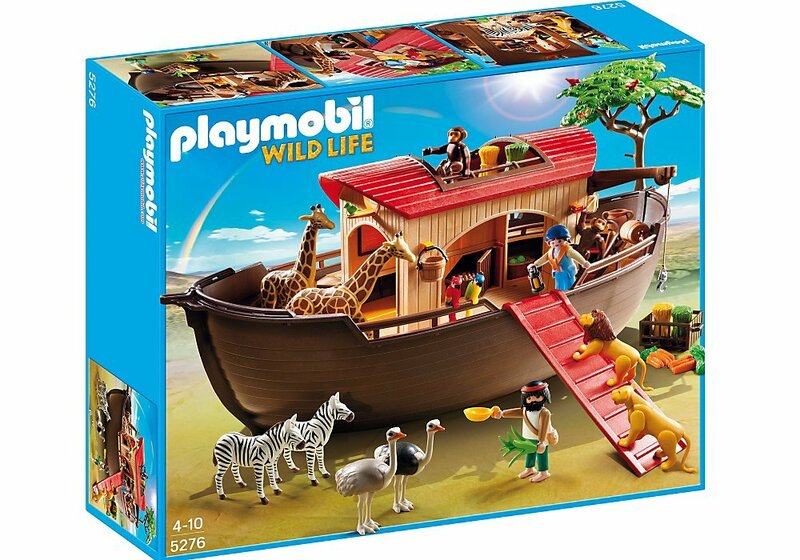 Children can upgrade this set with the PLAYMOBIL Underwater Motor (#7350), which will automatically propel the ark through water. Dimensions: 20.5 x 9.6 x 8.3 in (L x W x H). Don’t let moving large, bulky materials slow down work on the construction site. Let the Large Crane with IR Remote Control do all the heavy lifting! The included IR remote control allows kids to maneuver the crane’s arm, trolley, and crane hook with precision, making it easy to lift and move any material. The crane arm can pivot from side to side, while the trolley can move materials forwards and backwards, as well as up and down. Set includes one figure, crane, remote control, pallet, and other accessories. Requires 6 x AA batteries (not included). Dimensions: 27.2 x 12.6 x 30.3 inches (LxWxH). You can purchase all these Playmobil toys and many more from the Playmobil website.